Leading the journey to sustainable excellence requires the flexible combination of leadership activities, behaviors, and individual characteristics that work together to use the forces and facilitators to transform the organizational systems and culture. The leadership framework is based on research and 25+ years experience working with leaders to help them transform their organizations to achieve and sustain excellence. The leading transformation framework is composed of five not so easy pieces organized into two groups – Leadership and Organization. The leadership triad consists of a leadership system (activities), leadership style (behaviors), and the individual leader characteristics (the invisible dimension). These three dimensions of leadership work together to change the organizational systems, culture, and individuals to achieve sustainable excellence. Nine systematic leadership activities form the core of the leadership system. These could be considered the “science” of leading transformation. Focus of the transformation is to increase the value created for multiple stakeholders including the workforce, customers, investors, suppliers and partners, the community and the environment. The focus on stakeholder needs and relationships helps provide a common alignment point for strategy, execution, and learning. There are nine leader behaviors in the framework that support the system for leading transformation. These could be considered the “art” of leading transformation. There is an old saying in the military, “a leader is always on parade.” Leader as a role model is probably in every leadership book and course on the planet. And, for good reason. However, in this case, it takes on a slightly different connotation. The third component is a look below the surface at the individual leader characteristics. Leaders of transformation have five characteristics that increase the odds of achieving and sustaining high performance including purpose and meaning, humble but confident, integrity, systems perspective, and motivational and attitudinal patterns. The leaders of high performance have a deep personal meaning and sense of purpose. They communicate the compelling directive to help provide meaning for the entire workforce. 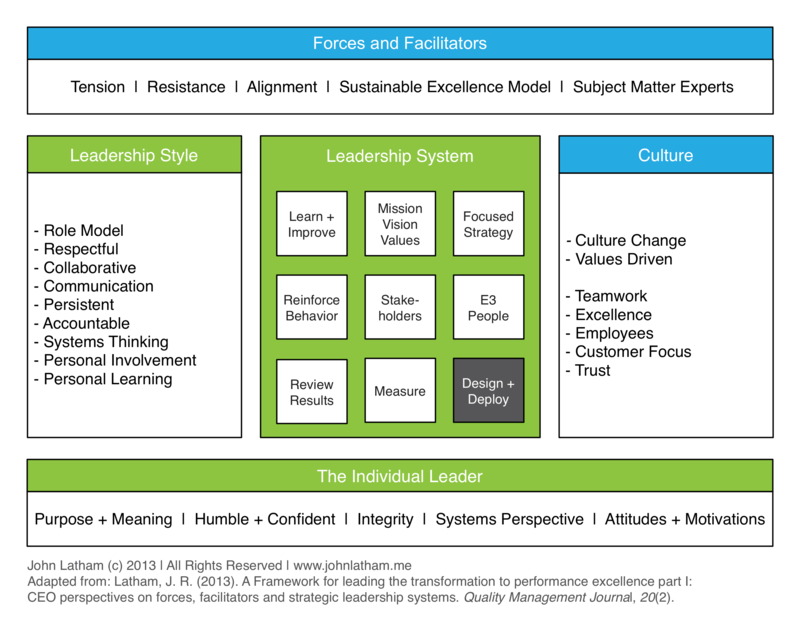 The organization components of the leadership framework include the internal and external forces for change (tension and resistance), facilitators of change (alignment, sustainable excellence model, and subject matter experts) and the culture of the organization. There are several forces and facilitators of organizational change that are common to successful transformations. While the motivation for change varies widely, there must be enough tension to overcome the inertia of status quo. The first step in managing the forces of change is to create tension in the organization to overcome the current inertia. Ultimately, sustaining excellence requires that the new systems, processes and practices become habits and embedded in the culture. Culture is composed of values, norms, traditions, symbols and rituals. In the end, individuals are the essence of any sustainable change. Sustainable change requires that the individuals change and grow, which is often the hardest part of the change process. Want to learn more about the leading transformation and the framework? Check out the resources page for papers, presentations, videos, and online articles that address the framework and components. Explore the Leading Transformation Resources.